The legend of Tyler Danish continues to grow in the state of Florida. The 6’-1”, 180-pound right-hander tossed another complete game on March 27, striking out 12 to one walk. He has five complete games over eight starts and has yet to allow an earned run on the season. He is now 8-0 with 85 K/9 BB over 49 innings, allowing just 18 hits. He fastball has been clocked at 95 mph and sits in the low-90s with late life and movement. A great athlete, he is also hitting .360 over 19 games with four home runs, 17 RBI and a 1.145 OPS. Already considered a lock to go in the first five picks of the 2013 MLB draft, Meadows has been stellar this season, showing off the five tools that will make him a special talent at the next level. Over 14 games, the 6’-3”, 200-pound left-hander is hitting .568 with seven doubles, four home runs, 17 RBI and has drawn eight walks for a .660 OBP/1.081 SLG. He has also stolen 12 bases in 13 attempts. The 6’-3” right-hander can dial his fastball up to 96 mph, and his low-80s change-up is a solid offering. He has simply overpowered high school hitters the last two years. As a junior, he struck out 159 batters over 77.1 innings, going 11-1 with a 1.27 ERA over 17 starts. His 18.5 K/9 ratio last season was bonkers. This season, he has actually upped that number. Over 22 innings, he has struck out 48 batters to nine walks, good for a 19.6 K/9 ratio. He hasn’t allowed an earned all year. The only knock on him has been his control as he had a 6.4 BB/9 ratio as a junior. He has cut that number almost in half with his 3.7 BB/9 mark this year. Huge upside as a power arm. At 6’-3” and 200 pounds, the right-hander projects to a high-average hitter with power and speed. His plus arm and instincts in the field will allow him to stick at the hot corner. Over seven games this season, he is 6-for-12 with a double, home run, six stolen bases and has drawn a staggering 16 walks as opposing pitchers have stayed away from him. The son of former major league closer, Bryan Harvey, Hunter inherited his dad’s canon arm. Sitting in the 92-94 mph range, and hitting 97 mph, Harvey has been blowing away hitters all season. On March 28, he struck out an absurd 17 batters over six innings and now has 56 K/5 BB over 24.2 innings, allowing just 11 hits. A great athlete, he is also hitting .432 over 11 games with seven walks to two strikeouts. 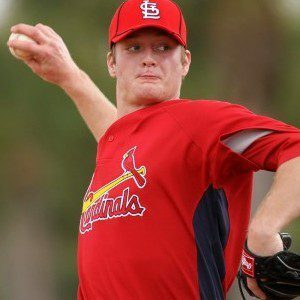 The 6’-3” right-hander, who most believe is the best prep arm in the 2013 MLB draft, has been showing no ill effects from the arm injury that caused him to miss the first few weeks of the season. Over his last two starts, he has tossed seven perfect innings, striking out 13 batters. He has flashed his mid-90s heater to go along with a mid-80s plus slider. His command is excellent and so his is mound presence. He is still on a low pitch count, but as the season goes on, he should go deeper into games. The 6’-3” right-hander has put up some pretty ridiculous strikeout totals over his career. As a sophomore, he went 9-2 with a 1.69 ERA and 123 strikeouts over 83 innings. As a junior, he went 7-2 with a 0.94 ERA and 119 strikeouts over 67.1 innings, allowing just five walks. This year, he has 58 K/3 BB over 35.2 innings. For a career total of 300 over 186 innings. He features a low/mid-90s fastball and also adds a power curve. His change-up is a solid offering and he has excellent control of all three. He has played on the game’s highest stage, having been a multiple member of Team USA. A great athlete, Wrenn is a 6’-2” right-hander with a great approach at the plate and plus speed. Over 16 games he is 21-for-43 (.488) with six doubles, two home runs, 14 RBI and has stolen 19 bases. He also has drawn 18 walks to just five strikeouts for a .662 OBP/.768 SLG. That combination of patience/speed makes him a prototypical leadoff player, and he also has pop in his bat. The 6’-3”, 200-pound right-hander is emerging as one of the best power bats among the prep ranks. He obviously already has the size, and the fact that he hits from the left side makes him even more desirable. Over 10 games this season, he is 14-for-32 (.438) with three doubles, a triple, three home runs and 14 RBI. He has also drawn four walks for a .514 OBP/.875 SLG. A two-sport star, his potential in baseball is sky high considering he hasn’t been fully committed to the sport. One of the better pure hitters in the 2013 MLB draft, the 6’-2” right-hander has come out of the gate on fire after an offseason spent rehabbing a hip injury. Over six games, he is 7-for-16 (.467) with four doubles, eight RBI, three walks and a stolen base. Able to play multiple positions, he is a great athlete who projects as a top-of-the-order hitter with speed and pop. Feel free to follow me on Twitter @DanMKirby for 2013 MLB draft updates, prospect and Chicago Cubs news.